Freeman's has a vast assortment of fencing solutions to meet your specific needs. Contact us to discuss your requirements and we'd be happy to provide options and a free estimate. We keep an excellent selection of treated wood posts and rails, landscape ties, orchard props, and more. Discounts are offered on full bundles, and a post pounder is available for local rentals. Our selection of steel fencing includes a variety of deer, farm and non-climb fence, poultry, rabbit and stucco mesh. If you need wire, look no further! Freeman's carries both smooth and barbed wire, as well as brace wire. Ornamental iron fencing, vinyl alternatives, chain link, dog kennels, and even custom iron gates are also available by special order. 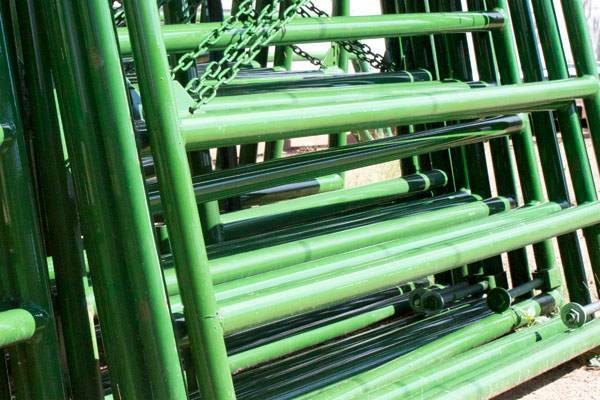 Freeman's is a proud dealer for HiHog Livestock Handling Equipment, including panels of various sizes for portable fences and round pens, gates, chutes & feeders, stall fronts and dividers, and even picnic tables! Visit hi-hog.com for more information on available products. We are also a dealer for Gallagher electric fencing. If you need electric wire or tape, insulators, portable posts, or plug-in, solar or battery stations, we've got it! To learn more about their fine products, please visit www.gallagher.ca.